After the PvP system was removed from the Wilderness, Jagex - the creators of RuneScape - designated the Bounty Hunter Activity to replace the old system. However, because of some players' demands, PvP worlds were added to compensate the loss of a free PvP system. In PvP worlds, you can attack other players (within a limited combat level range) nearly anywhere, with the exception of banks and some Activities. PvP worlds are available in free-to-play and members' worlds. PvP and Bounty worlds were removed from RuneScape on 1 February 2011. This content serves only as a historical reference. Warning: PvP (Player vs Player) is not safe! You will be automatically skulled upon entering the world. Since you are skulled you will not be able to keep your three most valuable items. The protect item prayer is disabled on PvP Worlds. You are always risking everything you wear and everything in your inventory. Beware: On your death, you will not receive a gravestone to get your items back! If you're planning to stay in a Player vs. Player world, then it is recommended that you have around 10-18 Monkfish, Swordfish or Lobster, 2-6 potions (Varying type), and the remaining free spaces for drops and/or teleportation tabs used in emergencies. You should have at least 40 in the combat skill you are using (e.g. 40 Strength, Defence and Attack, 40 Magic, or 40 Range) and have at least 30 Prayer (recommended.) Also, for members, a higher Agility level is recommended, for quick run restoration. There aren't any items that you must take. Take items that help you in what ever type of PvPing you're doing! Don't take items you mind losing! Before you can start fighting, you will need to know which worlds are PvP and how to get on to them. Note: You must be level 20 combat or higher! 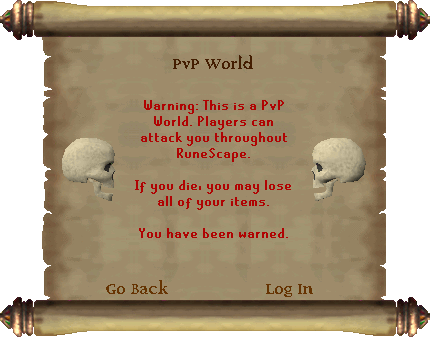 The only PvP Worlds are Worlds 26 and 86 for Members and Worlds 21 and 17 for Free Players. If you decide that you don't want to log on you can just click on "Go Back". When you first enter a PvP world, you start in the safe area around Lumbridge Castle. You are also given a book in your inventory. You can speak to Doomsayer in Lumbridge to get another. Both of these only happen the first time you log into any PvP world. After that, you stay where you were when you last logged out. There are two sets of equipment that require 78 Defence for armor and 78 Attack for weapons for one hour of use, or 20 Defence and 20 Attack for 15 minutes of use which belonged to the warriors Vesta and Statius. There is one set of equipment for Magic that requires 78 Magic, 78 Attack for weapons and 78 Defence for armor which can be used for hour of use, or 20 in each of those three skills for 15 minutes of use. There is one set for range that requires 78 Defence (for the armour) and 78 Ranged (For the bow) for 15 minutes of use. Attack your opponent with your Dragon scimitar/whip. Once your opponent gets low on health, pull out your Dragon dagger(p++) and use the special attack to try to perform a "knock out" (KO). The reason for this is so that you can do high damage to finish off your opponent, before they actually run out of food. Use a Rune Scimitar - once your opponent gets low on health, pull out your Rune 2 handed sword and try to KO them. Use a Rune Crossbow with Addy/Dragon bolts. Once your opponent gets low on health, switch to Dragon/Onyx Bolts to knock them out. Use a Magic Shortbow. Once your opponent gets low on health, use the special attack to KO them. Use a Magic Shortbow. Once your opponent gets low on health, switch to your Dark Bow (and Dragon arrows) and use the special attack to KO them. Use a Maple Shortbow. Once your opponent gets low on health, pull out your Rune two-handed sword (or a corrupt dragon weapon) for a KO. The hits will stack and you get a "double hit." Method one: Use the Ice Blitz spell from the Ancient Magicks spellbook, then a Rune Crossbow/Dragon Dagger (p++) to KO them. Get a Fire staff and the required runes for fire strike (or fire blast), then, once your opponent is low on health, cast Bind (from the normal spellbook) and use a rune weapon to KO them.